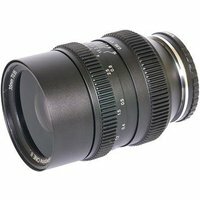 Suitable for photography and cinematography, the SLR Magic 35mm T0.95 HyperPrime CINE II Lens is a super-fast prime for Sony E Mount mirrorless cameras. It features a bright T0.95 aperture for stunning low light footage, in addition to beautiful bokeh for artistic and dreamy shots. The decoupled aperture and smooth focus allows for seamless transition of exposure and focus for video work.